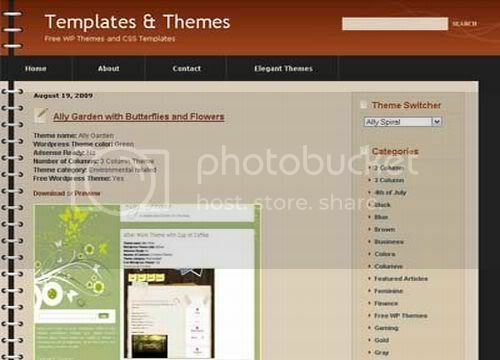 Free Website Templates, Wordpress Themes, Blogger Templates, php-fusion Themes, CSS Templates, Flash Templates, Joomla Templates and CMS Templates. Wordpress Spiral Blog Brown Web2.0 Theme Template, Very High Quality Design Theme for Wordpress called Ally Spiral, come with 2 Columns, Dark Brown and Fresh Rounded Colors, Left Sidebar, Fixed Width and Web2.0 Style Interface, Professional Theme for Personal blog or Writers Blogs, The theme’s .zip-package includes all necessary files and Can be used on Any Wordpress Version Plateforme. Please Don't Spam, if You need to be listed at our Links Area, just Contact us at : deadmix@gmail.com we will be happy to Review your Website and do a Link Exchange with you.